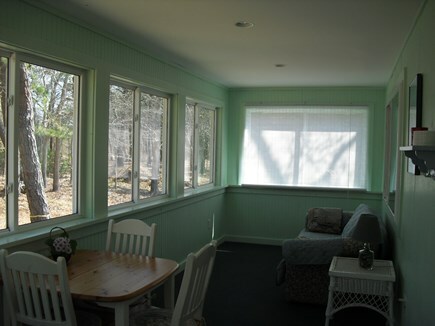 Newly constructed cottage, centrally located in East Chop (Oak Bluffs). Sleeps 4. 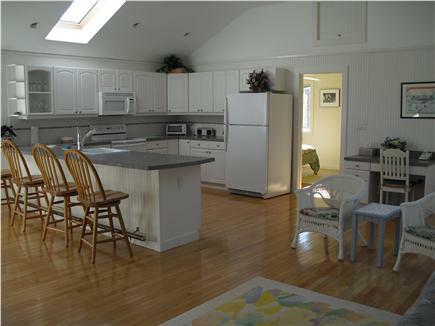 Open floor plan includes a full-size kitchen, fully applianced. Sunny master bedroom, great room with skylights, modern bath, 3 season porch, and blue stone patio, furnished with teak dining set. Styled with a true cottage atmosphere. 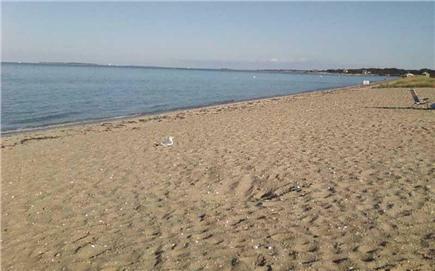 Short walk to beach, town, ferry, boat launch, marina, and public transportation. Harbor activities, music concerts, community sings, and art shows. Minimum stay: 7 days, but would prefer longer rentals. Adults preferred. Cottage is not set up for babies or younger children. No pets, no smoking. Rent includes a few for cleaning service. My sister and I spent a week at the cottage in late June. 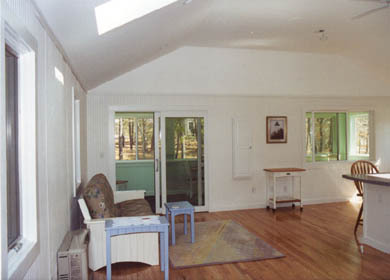 The skylights in the great room provided much light and brightness. Looking at woods from the 3-season porch was most enjoyable. The cottage was clean and it certainly was a quiet stay. Location was good. Bob was attentive but not bothersome. Furniture and appliances were high-end. 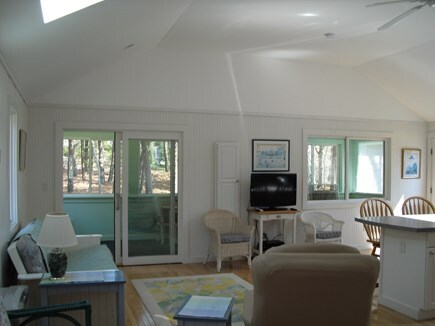 It was very noticeable that the cottage was taken care of by the owner. We loved out stay! Beautiful, private location set in the woods. We have been coming to this location for three years now. The homeowner treats us great every year we show up. 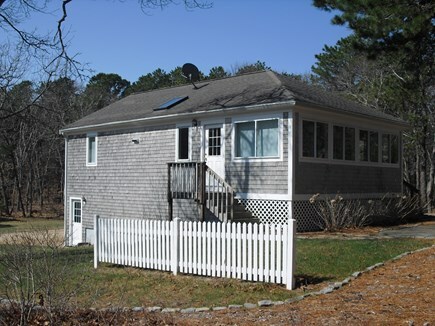 I highly recommend this cottage for your summer getaway on Martha's Vineyard! This was a last minute booking, and we couldn't have lucked out any more than we did! We had only our bikes (highly recommended) on the island and the location couldn't have been more perfect. 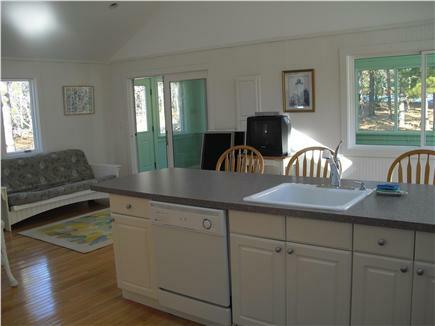 Super quiet neighborhood, densely wooded with beautiful gardens on the property. Just a 5 minute bike ride to Oak Bluffs' Ferry and Circuit Ave , and even closer to the fantastic little hidden gem of a public beach next to the East Chop Beach Club. Secure garage parking for all 4 bikes and our trailer. 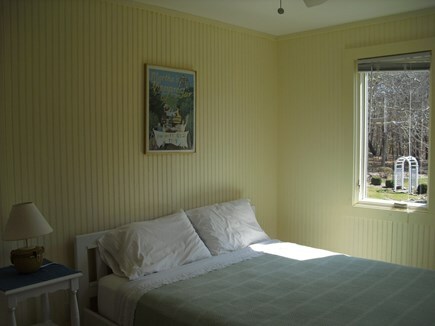 The house is listed as sleeping 4, but there is a queen bedroom as well as two fold out couches, so there was plenty of room for the two of us and our 3 boys (ages 4, 6 and 8). Well stocked kitchen with spices, and basics (paper goods, saran, dish soap, etc...) in good supply. The indoor shower saw no use, since the OUTDOOR SHOWER WAS AWESOME!